PRICKLE. There are some genes implicated in human epilepsies that we have a hard time making sense of. PRICKLE1, implicated in a recessive progressive myoclonus epilepsy, is one of these genes. 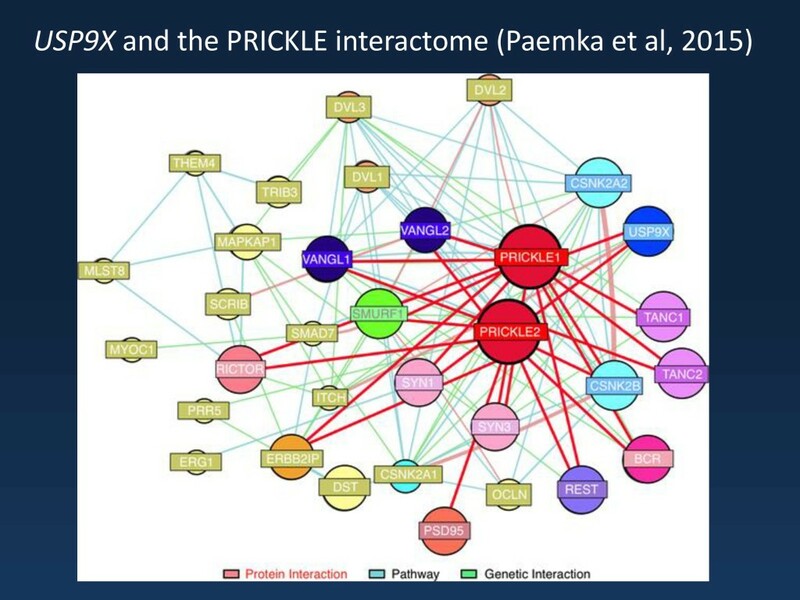 In a recent publication in PLoS Genetics, the interactome of the enigmatic PRICKLE proteins is explored. The authors rediscover an almost forgotten gene implicated in intellectual disability. ULD2. The progressive myoclonus epilepsies (PME) are devastating neurological disorders characterized by prominent myoclonus. The PMEs are a distinct group of epilepsies, which are usually divided into major groups. Unverricht-Lundborg disease (ULD) is the prototype of the ULD-like PMEs, which have preserved cognition until later disease stages, while the PMEs following the pattern of Lafora body disease show prominent neurological decline and dementia early on. ULD is mainly due to an expansion of a dodecamer repeat in the 5’-UTR of the Cystatin B (CSTB) gene. However, there were some ULD families with a very convincing phenotype, which did not carry mutation in CSTB and which linked to an entirely different chromosomal region. In some of these families, homozygous mutations in PRICKLE1 could be identified. Microtubules. The function of the two PRICKLE proteins in humans is not well understood. There is some evidence that both PRICKLE1 and PRICKLE2 play a role in axonal transport. Neurons face the enormous task to constantly shuffle proteins back and forth between the cell body and the synapse. In some neurons, this distance can be more than several feet and the length of the axon can be up to 10,000x the size of the actual cell body. Microtubules are small tube-like structures within neurons that present the tracts for the transportation machinery, which allows dynein and kinesin motor proteins to literally walk up and downs these tracts with their cargo in tow. Accordingly, neurons spend an enormous amount of energy on protein trafficking and small disruptions to this machinery may be devastating for the neuron. Not much is known about the PRICKLE proteins; however, there is data to suggest that the PRICKLE protein affects the dynamics of how the axonal microtubule highways are generated and remodeled. Interacting partners. In their recent publication, Paemka and collaborators look at interacting partners of the mysterious PRICKLE proteins. They assess the interactome of the PRICKLES, the entirety of the proteins that interact with these proteins at some point. The authors stumble upon known interaction partners such as SMURF2 and TANC2. In addition, the authors stumble upon USP9X, a de-Ubiquitinase, an enzyme that prevents the PRICKLE from being sent to the proteasome, the cellular trash bin. Ubiquitin. The name ubiquitin already suggests that it may be present in many cells of the body; it is literally ubiquitous. Ubiquitin is small protein that can be attached to other proteins in their cell. This process, called ubiquitination often marks proteins that should degraded in the proteasome, the cellular protein destruction device. As with many cellular processes, adding and removing ubiquitins from cellular proteins is a dynamic process. De-ubiquitinases remove the ubiquitins that were added by ubiquitin ligases. The most common ubiquitin ligase is probably UBE3A. Mutations in the UBE3A gene are known to cause Angelman Syndrome. USP9X removes ubiquitins from PRICKLE proteins. As a net effect, the presence of USP9X stabilizes the expression of PRICKLE proteins, which is shown by Paemka and collaborators in a set of experiments in cell cultures and mouse brain. Accordingly, if USP9X is not present or not working properly, it drags PRICKLE function down with it. Mutations in USP9X. After assessing the function of the USP9X protein, the authors went on to assess whether mutations in USP9X can be found in patients with epilepsy. By screening 284 male patients with epileptic encephalopathy, they were able to identify one patient with a de novo mutation and another patient with a potentially disruptive mutation where segregation could not be assessed. The authors focused on male patients as USP9X is located on the X chromosome. In addition to the data presented by Paemka and collaborators, USP9X was initially described as X-linked recessive nonsyndromic mental retardation 99 (MRX99) and inherited variants were described in male probands of several families with intellectual disability. Also, in the DECIPHER data, two additional patients with de novo mutations in USP9X were described. Therefore, there is converging genetic data implicating USP9X in human neurodevelopmental disorders. What you need to know. A search for interacting partners of the mysterious PRICKLE proteins led Paemka and collaborators to identify USP9X, a protein important for PRICKLE stabilization. Mutations in the USP9X gene itself can be identified in individual patients with epileptic encephalopathy and intellectual disability. There seems to be an interesting pathway emerging that centers on the role of PRICKLE proteins in microtubule stabilization. This entry was posted in 2015, autism, Bioinformatics, Epileptic encephalopathy and tagged beta-propeller-associated neurodegeneration, epileptic encephalopathy, GOSR2, KCNC1, Lafora disease, laforin, malin, PME, PRICKLE, Unverricht-Lundborg disease, West Syndrome, X-linked mental retardation. Bookmark the permalink.